'Hard to see PM and wife watching World Cup in Russia while bereaved families go from memorial to memorial,' said Hadar Goldin's father. The father of Lieutenant Hadar Goldin who was killed in Operation Protective Edge and whose body is held by Hamas in Gaza attacked Prime Minister Binyamin Netanyahu this evening. 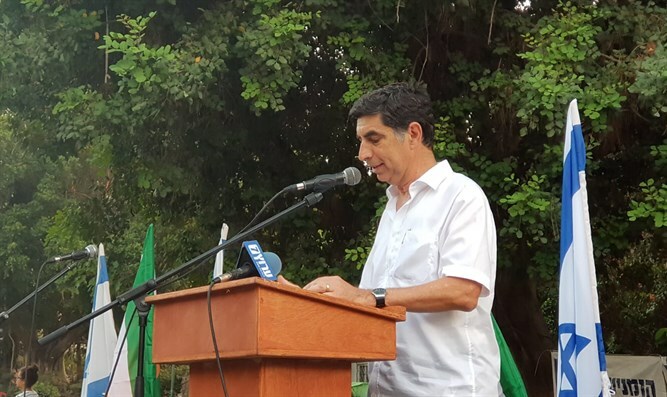 "It's very difficult to see the Prime Minister and his wife watching the World Cup in Russia while we, the bereaved families, move from memorial to memorial, and that's the truth," said bereaved father Simcha Goldin at the memorial ceremony for his son in the Kfar Saba military cemetery. "For four years Hadar has been in the hands of Hamas, and the government of Israel, which sent Hadar into battle, is failing to bring him back. Instead of following the order not to leave soldiers in battle, the Prime Minister is making excuses, manufacturing fears, and issuing threats." "Our brothers, the fighters: Do not despair; we deserve a more valuable leadership, we will build it, we will educate our leaders - this is the role of the public; Misdar Hadar will do it, and we're starting here" said Prof. Goldin. "Prime Minister Binyamin Netanyahu closed an agreement after Operation Protective Edge, leaving two fighters in enemy hands. What were you afraid of? Where did you rush off to? This will never happen again. We're after four long years, years when we believed in the government that every deal with Gaza would have a precondition. We believed him because we assumed a person who talks so much about soldiers and bereavement wouldn't lie to a bereaved family. "This Prime Minister abandoned all his promises when he signed the reparations deal with the Turks. We're looking for values, we're looking for the courage, we're looking for the covenant. Had the Prime Minister kept his promise, Hamas would have understood. We wouldn't need to be dealing today with balloons," added Prof. Goldin. Earlier, Education Minister Naftali Bennett spoke at the memorial service, saying, "In the world we are criticized that our Gaza Strip policy is immoral. I have news for all our critics - it is immoral to stand on the sidelines and bide time while the South is burning. It is immoral to pity terrorists from Gaza and not children from the Gaza area. "I will say this clearly: It is better to be condemned by the world for killing kite-launchers than to eulogize children who'll be hurt in kindergarten. Whoever launches fire balloons at our children is a terrorist and must be liquidated." Ayelet Kaufman, the sister of Hadar Hy"d, burst into tears as she spoke to her brother: "I'm trying to talk to you, to revive you, with infinite longing and to tell you about us. I don't know where to begin. The first and most crazy thing is the pregnancy and birth of my twins Neta and Yair. "Is this your little wink from afar? They revive you; it hurts that you don't know them. This is the first time that something big happens to me in life and you're not part of it. At the same time, it's impossible to describe how much you're present as their uncle. The emptiness cannot be explained. You can't explain how much you're alive for me, breathing and laughing and supporting and hugging."